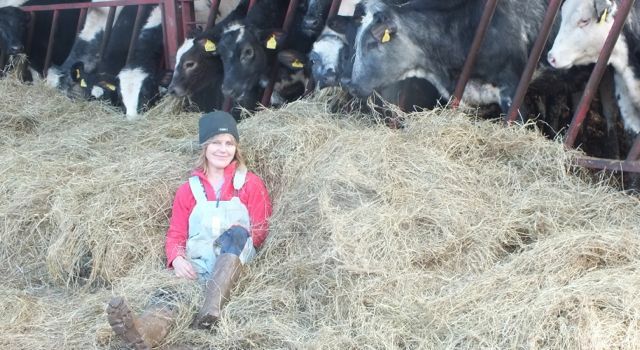 2015 was a bad year for British farmers, here’s hoping 2016 will be kinder. 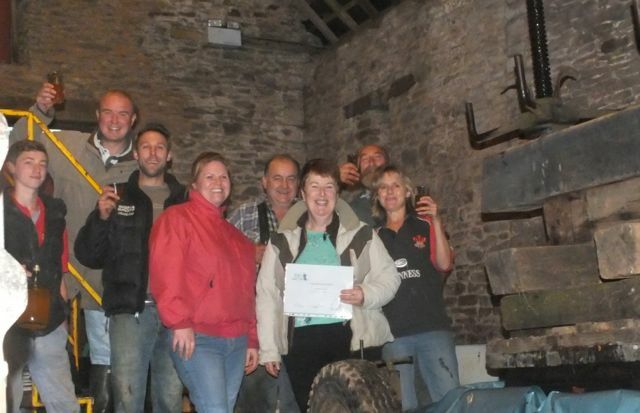 RABI (Royal Agricultural Benevolant Institution), is a charity supporting farming families in need and this week the Monmouthshire branch was launched with a quiz at our local livestock market. Support was overwhelming and a great time was had by all with amazing food and Jim’s cider on tap…hic! Hopefully the first of many events raising awareness of this wonderful charity. The name of our farm translates to “home of the frost” and this was certainly true earlier this week. Made a nice change from the relentless wet weather over Christmas and New Year. The classroom is having a cleanout as February lambing courses are nearly all full and we also have a school group visiting the farm. Education is so important in our industry and I’m proud to be a Bright Crop Ambassador, promoting positive perceptions in agriculture and will be attending our local secondary school’s careers evening in a couple of weeks to hopefully inspire budding future farmers in areas of technology, engineering and science. Our own future farmer Sam has just left school, attends college one day a week and has worked hard and saved for a 3 tonne digger with which he’s making more money than we are with the sheep! With his forward thinking ideas, we think this young entrepreneur will go far. We’ve just returned from our annual visit to the Royal Welsh Show where Prime Minister David Cameron announced that he is going to reduce red tape for farmers which is great news following our recent sheep inspection. All sheep were counted, tags checked and paperwork examined in detail so stress levels were high but following a five hour inspection, we passed with flying colours. A week later we were informed that an inspector was coming to inspect the inspector who did the inspection. When he arrived I asked (tongue in cheek) if there was going to be another inspection to inspect him, I was told that it was possible from Europe. So yes Mr. Cameron, I think it’s a cracking idea! 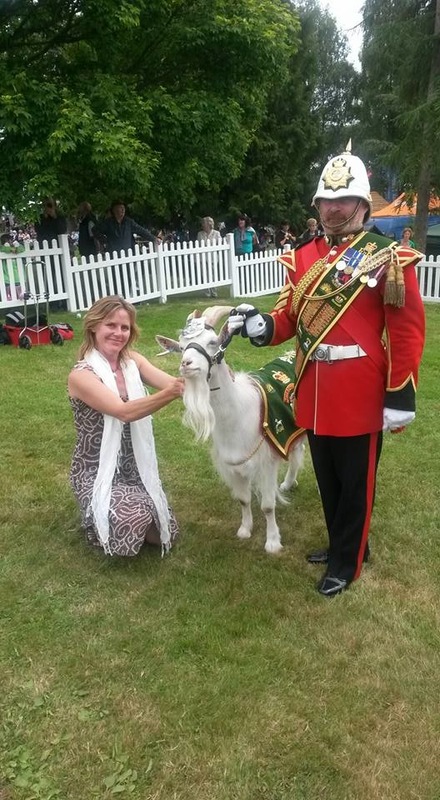 Meeting the Royal Welsh Goat. 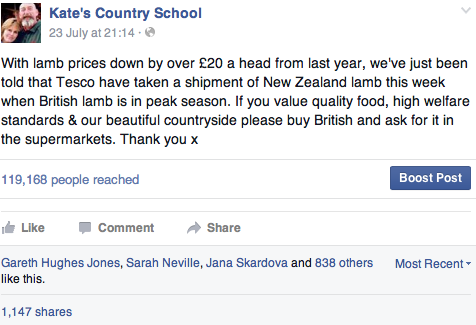 We recently heard that Tesco have taken another shipment of New Zealand lamb when our lamb is at peak season. 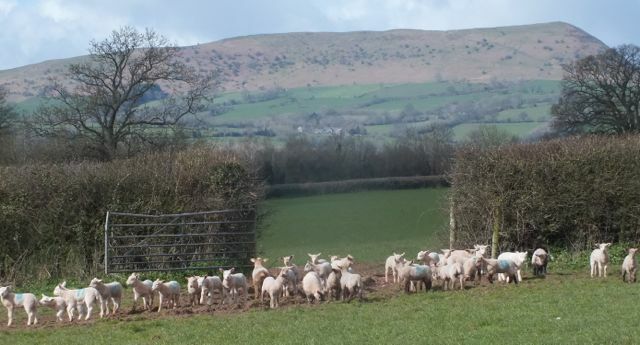 At the time of writing this blog, with our lamb prices at rock bottom, we are still awaiting a response from Tesco regarding it’s lamb sourcing policy. Explaining the situation on social media resulted in an overwhelming positive response from the public, reaching over 100,000 people. We really appreciate the support, thank you. At the end of the day, the consumer has the power to make change through informed choices. Showcasing our produce is what shows like the Royal Welsh do well and supermarkets need to follow suit with produce labelled and displayed effectively to aid customer choices. 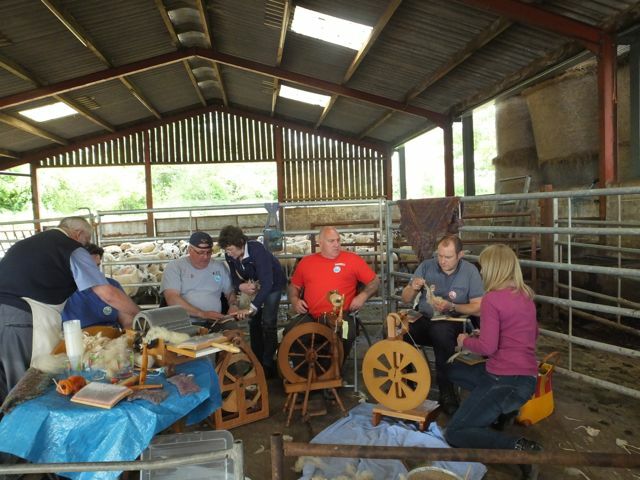 Courses on the farm are very popular and we’ve recently added team building days to the list. 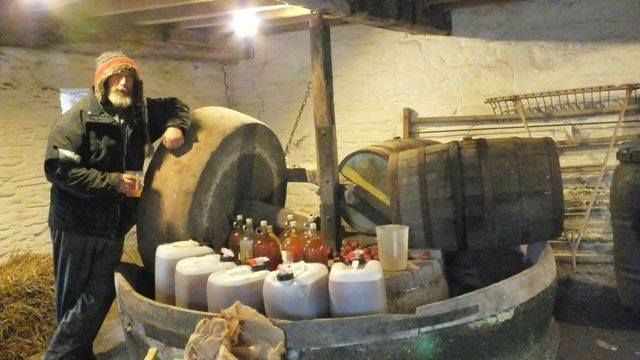 Last month we had members of the armed forces rounding up sheep, shearing, wool rolling, spinning and sampling our home produced cider. 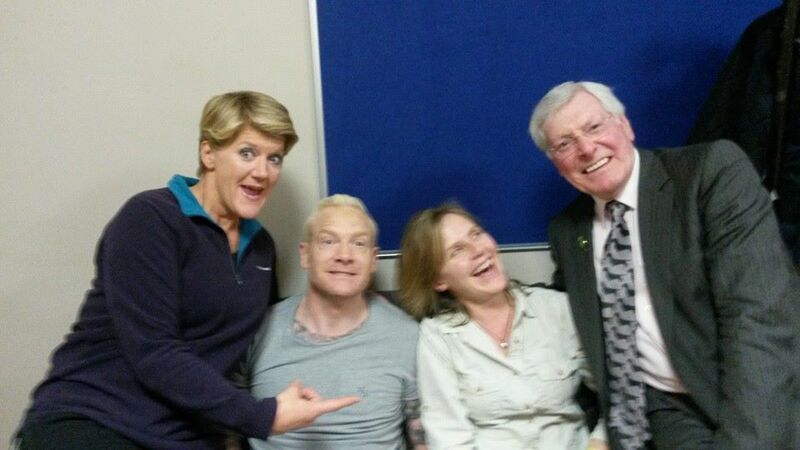 A great day was had by all…..hic! 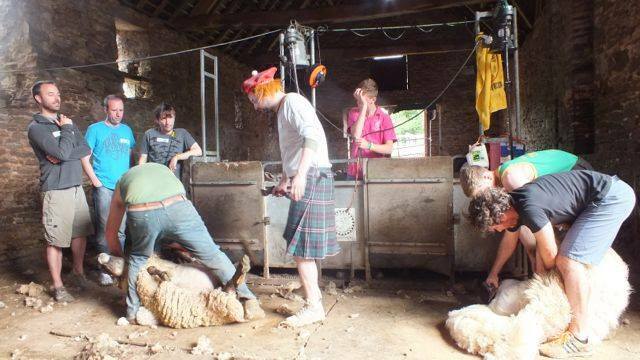 No sexism here, whilst the girls were shearing…. With no holiday planned for this year, I’ve put up the tent by the river and escape to it whenever time allows. I was joined by this lovely couple last week. Wine cooling in the river, cooking on an open fire and noisy otters joining us in the evening, it really is idyllic. On a final note I would like to congratulate son Sam and his team mates who are now the junior Welsh tug-of-war champions. They will travel to Ireland in September to represent Wales in the world championships. Good luck lads! 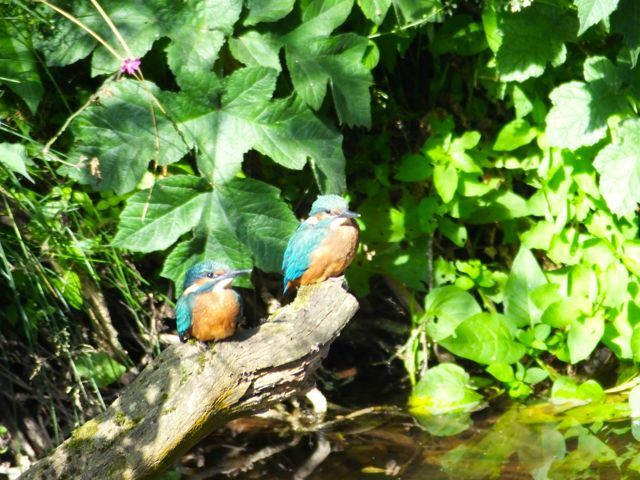 Kennel Club, Kingfishers and kids! Following a slow start to the lambing season, the new moon brought in the Chinese year of the sheep in style, with lambs popping out everywhere just in time for our lambing courses. 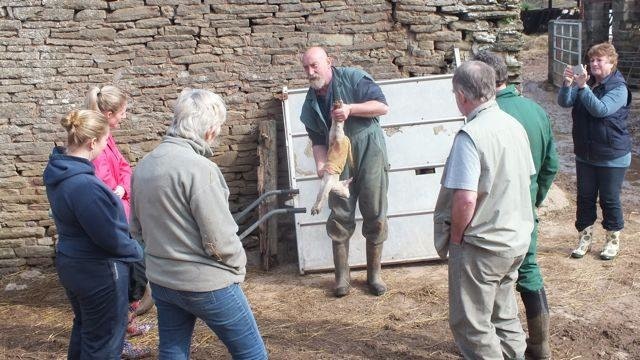 There were plenty of skinning techniques, adoptions, stomach tubings and mal-presentations to sort out. You can learn some aspects in the classroom, but nothing beats real hands-on experience. Well done to all our lambing graduates, it’s been a busy season! We’ve finally finished lambing with a total of 1350 lambs. 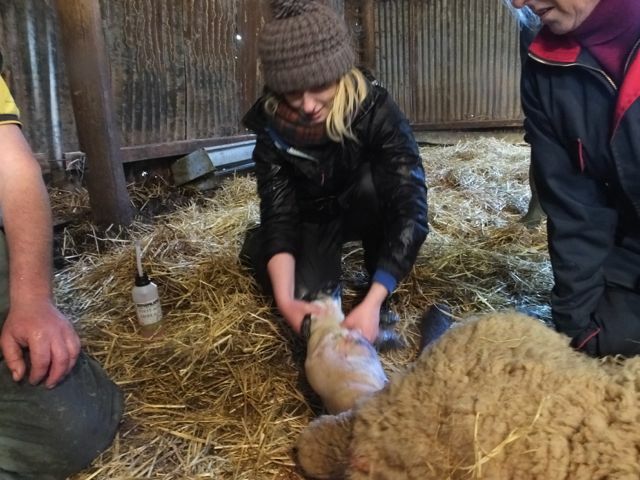 Another great educational resource is television and in March I swapped amniotic-fluid-covered overalls for clean clothes and a hotel room for a four-day lambing break, filming at Crufts. Covering a different canine topic each night, Friday’s film helped launch a new initiative from the NFU and The Kennel Club who have teamed up to produce a sign (to be put up around public footpaths) encouraging responsible dog walking in the countryside, advising walkers to worm their dogs and clean up after them to reduce the spread of infection to livestock. More detail can be found here. We have many footpaths through the farm and although the majority of walkers are great, there are always a few dog walkers that cause havoc. Only this week gates have been left open and “dog size” holes cut in fences where lambs can fit through. Hopefully these signs will help. 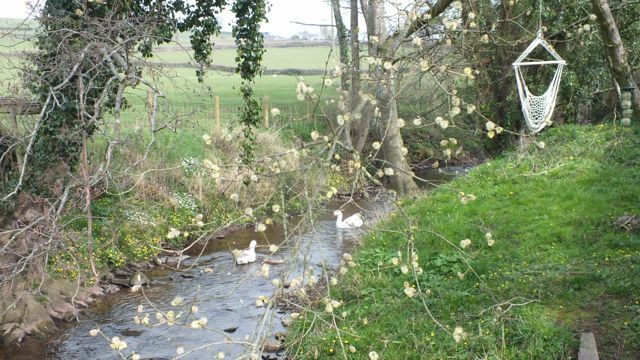 Our countryside is beautiful and is currently coming to life. 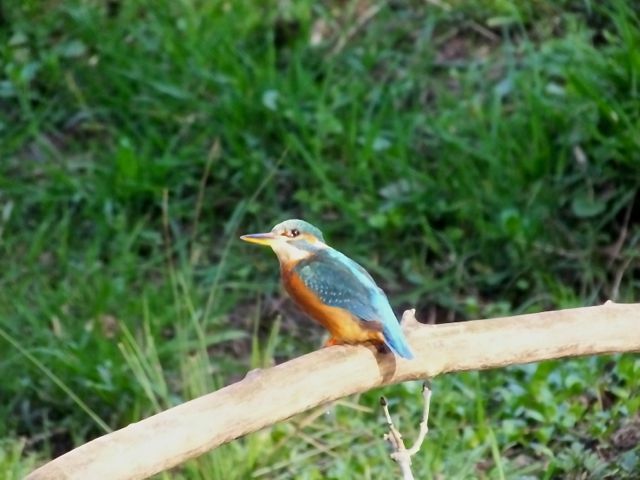 Trees are greening up, our Kingfishers are nesting and the first swallows have arrived on the farm, it is a lovely time of year. I wandered down the river this week and was rewarded with this wonderful photo. Farming and wildlife is a natural combination. It’s encouraging to see how many keen youngsters there are in the farming industry and local YFC clubs are thriving. However not all farm kids want to continue the family business and it would be unfair to put pressure on them to do so. Daughter Cel has no interest in agriculture as a career. She’s extremely talented in music and the arts and has just taken her options at school with future plans including university. Son Sam on the other hand, hates school, loves farming and with only a few weeks to go before his GCSE’s it’s been very difficult keeping him focused on schoolwork. Every time revision was mentioned during the Easter Holidays, he disappeared chain harrowing. 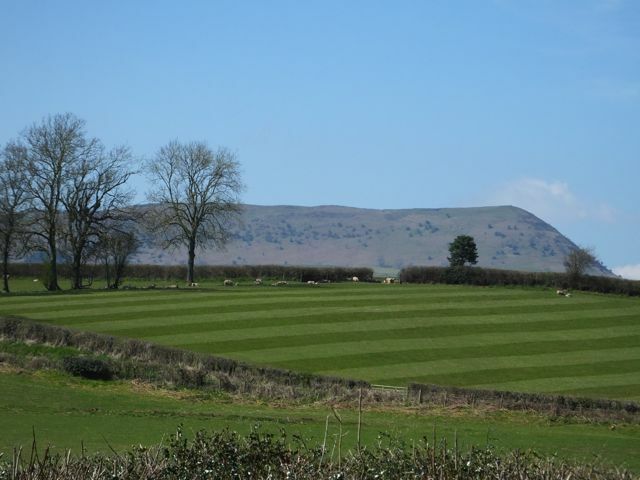 As a result our farm is now looking like a golf course and Sam has been offered work on the back of his impressive straight lines which were spotted from the road. This is on top various other agricultural jobs he’s already juggling. Maybe I’m worrying unduly about his education as he has a great work ethic and driving ambition, not all 16 year olds have that. Like all parents, we just want both kids to happy with whatever choices they make in life. Sam is very proud of his straight lines! Don’t care what they say, cider will always be part of my 5 a day! Recent news reports suggest that fruit juice is not as healthy as previously believed and that some fizzy drinks may be better for you. Well personally I think if we all stick to “natural” ingredients and simple sugars in moderation, this has to be healthier than artificial sweeteners and flavourings. A bit like real cider, made from 100% apples, has to be much better for you than ciders with 35% apples with 65% sweeteners, water, colours, flavourings etc.. (not that we’re biased!). Keep it simple, keep it healthy. Had a bTB test reading here on Friday and although we all suffered a high degree of stress, we got the all clear. After breathing a sigh of relief, we sat down to a nice cup of tea (with real sugar) only to find that the postman had delivered some tracer test requests (bought in calves to be tested due to their previous farm going down with bTB), so still more testing to do later this year. We’ve finished our courses here for 2014, with cider making being our booziest yet and we begin our lambing courses again in February 2015. Well done to all who attended them we have met some fantastic people and made new friends, its amazing how many people com back on more and more courses. I always think we might be enjoying this diversification a bit too much! Not sure what the animals think…. I’m heading to London again this month to talk at the Farm Innovation Show, please take pity if you see me wandering lost in the big city. Our tups have been working hard and the raddles (marks on the ewe’s bums from paint on tup’s chest) indicate that we are in for a busy lambing season from February until April. Why not join us? Additional March dates will be on the website this week. On a final note, sometimes its good to not fit in with the crowd. So hold your head up high and be proud as you walk on by….. Hold your head up high and walk on by. The evenings are getting darker…..
Just when we’re getting into the swing of the summer holidays, there’s an autumnal feel and I’m back at work (college that is, not my work as an unpaid farmhand) next week. Where did the time go? 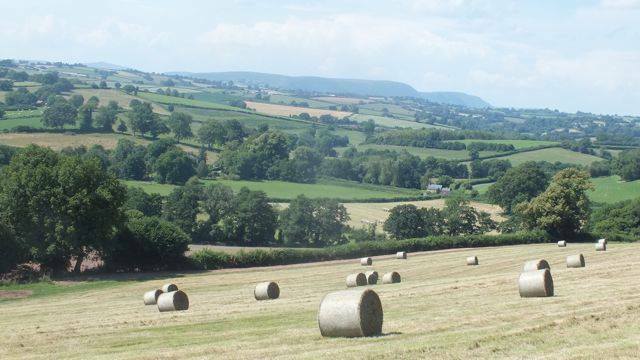 Haymaking is now complete and what fantastic weather we had for it during June and July. Combining is almost complete so we’re hoping the weather will be kind for another week. Our polytunnel is finally planted (better late than never) and we are hoping to have a fully home produced Christmas lunch as our turkey poults are growing well. 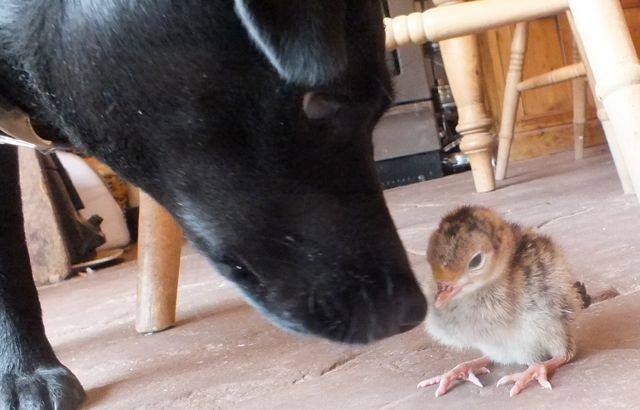 Terrier Gyp has taken a shine to this one! Our very free range piglets are running around the farm, causing mischief but currently getting away with it as they look so cute! We had our first stag party on the farm which was great fun although my risk assessments were in overdrive combining cider and shearing. More “fun” group booking requests are now coming in. If you fancy a party with a difference, please don’t hesitate to get in touch (cider compulsary). 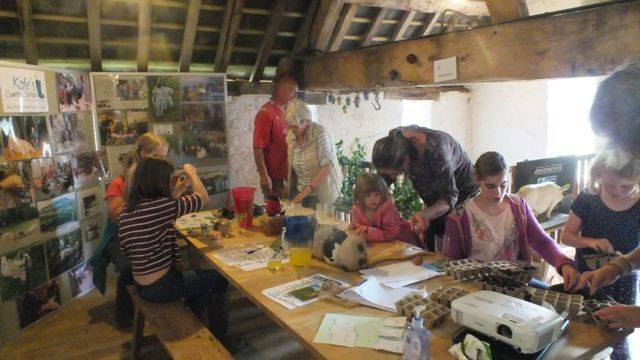 Our first Family course was a great success with students of all ages discovering how food is produced, tracking wildlife and enjoying home produced sausages cooked on an open fire, washed down with real lemonade. Children planted seeds to take home and nurture whilst the parent took some home produced cider home to sample, For medicinal purposes of course (part of your 5 a day)! 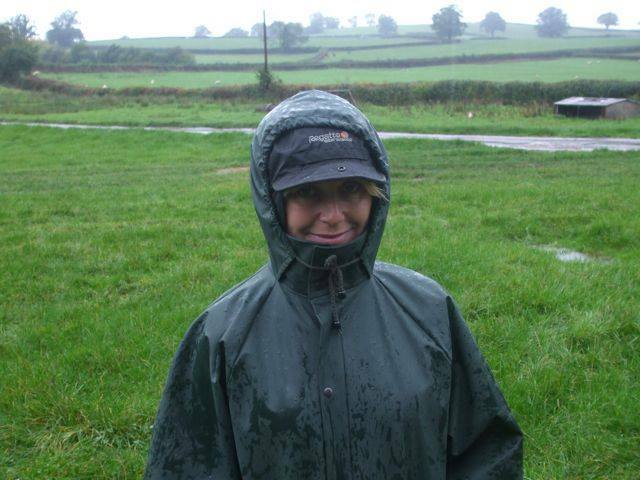 River dipping, estimating ages of trees, poo identification…. there’s so much to do outside, you just need to know where to look. This is a great time of year with shows, large and small, across the UK and beyond showcasing the best of farming and our beautiful countryside. 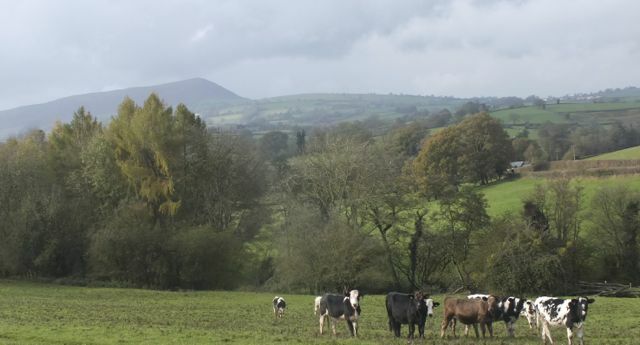 We will be at Monmouthshire Show on August 28th with the Kate’s Country School stand. Please come and say hello and have a go at our famous “Guess the Poo” competition. Don’t knock it until you try it! 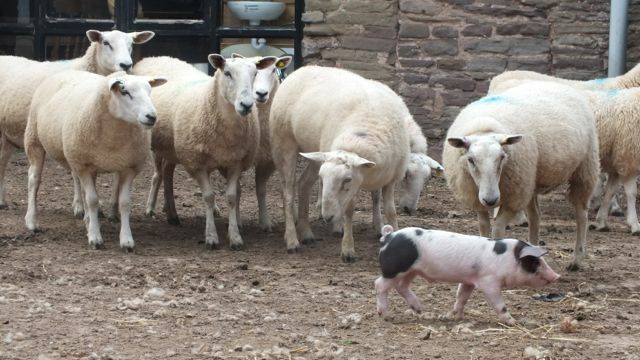 Teenage gangs are appearing around the farm. Spring is finally here after a very soggy February which made lambing difficult. 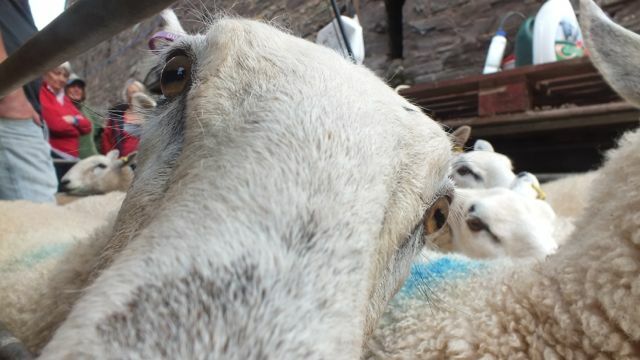 March was kinder and beside sleep deprivation, the lambing season has been successful with over 1000 lambs born so far. 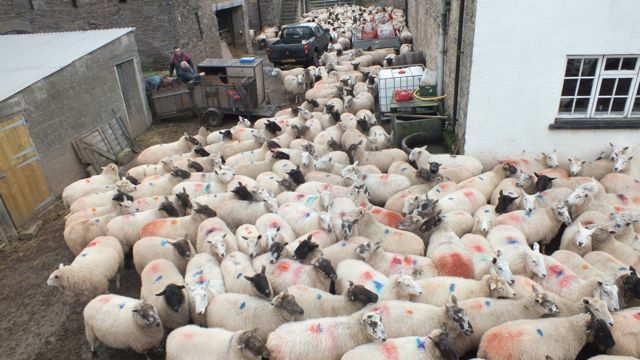 Each lambing course is different as it is a “warts and all” course and sheep are unpredictable. 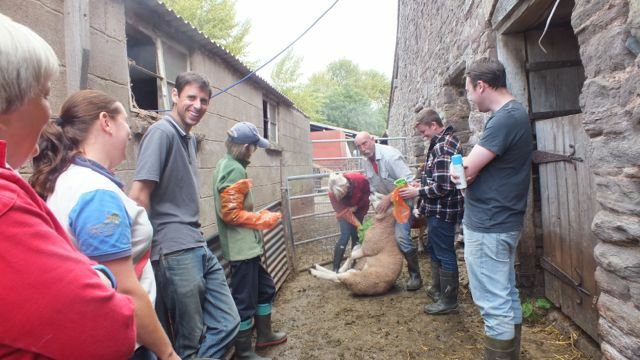 Courses were all busy with plenty of lambs born, stomach tubings, adoptions, lots of learning and…….cider! Here students are learning the art of “skinning”. 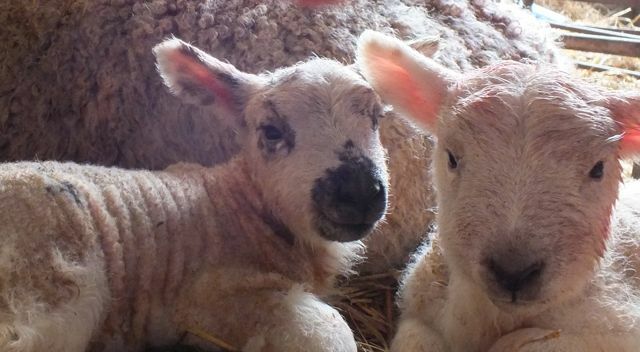 The skin off a dead lamb was put on an orphan so he’d be accepted by “Mum”. Worked a treat! It won’t be long and the cattle will be turned out for the summer months. Bucket reared calves have grown and are now very friendly cows. We have another TB test in May which, if clear, means we can sell from the farm again, fingers crossed. Very much looking forward to our Family Discover Day on the farm at Easter. It’s a joy to see children connecting with the countryside, having fun and getting dirty. 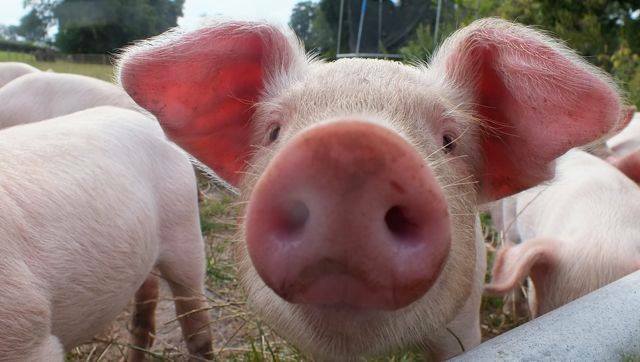 Countryside education is important as the link from farm to food seems to have been lost. We’re hoping to play a small part in fixing this. On a final note, life can get crazy at times and we all need time out, could be as simple as a soak in the bath at the end of a hard day. This is my secret hideaway, glass in hand I can “disappear” for a while and watch the kingfishers flying down the brook. So make sure you take a little time out for yourself to reflect and unwind. Stress causes all sorts of health problems which can sometimes be prevented. Our February lambing ewes have recently been scanned at 185% (an average of 1.85 lambs per ewe). We’re very happy with that result and if you’re booked on one of our lambing courses, looks like you’re going to be busy. 1 blue blob = twins, orange = single, 2 blue blobs = triplets. 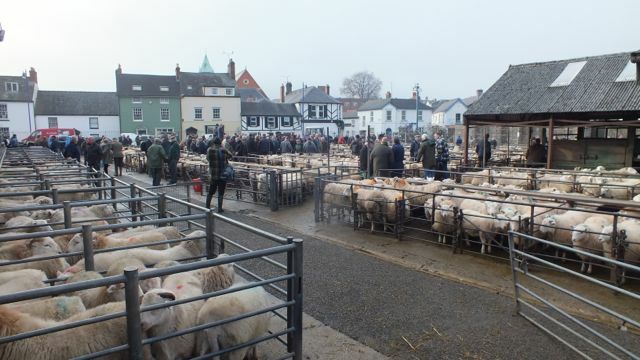 It was with sadness that after over 150 years of selling livestock, we had the final sales at Abergavenny market earlier this month. A new market has been built out of town and a supermarket is moving into our “market” town. I will certainly miss popping to the shops on market days and indeed the pub! As we head towards the end of December, it’s time to reflect on the year gone by and think about the new year ahead. Sometimes we moan about trivial things and don’t always appreciate what’s right under our nose. Make sure you value the things that really matter – family, friends and good health. On a final note, appreciate the wonderful world we live in. Go for a walk, splash in the puddles and have fun.